At its I/O developer conference, Google showed how it hopes to dominate business computing. It's making Android more business-friendly, expanding its range of apps, offering native Office editing, delivering stronger security and making Chromebooks more compelling than ever before. Simply put, Google's getting down to business. In the corporate world Google remains an also-ran: it's not just behind Microsoft, Oracle and IBM in the enterprise, but it's behind Apple too. According to the latest quarterly report by mobile services vendor Good Technology, Apple's iOS accounts for 92% of enterprise tablet activations. The picture's slightly better when you factor in smartphones, with Apple at 72% and Android at 27%, but it's clear that iOS has a significant lead over Google's mobile OS. 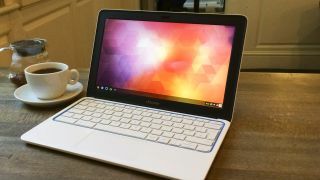 Sales of Chromebooks, Google's stripped-back notebooks, may be rising – ABI Research estimates that 2.1 million Chromebooks were shipped in 2013 – but the numbers are a drop in the ocean compared to sales of Windows PCs. Google's online apps have offered a simple and cheap alternative to Microsoft Office for some years now, and they've been improved again to make them more useful. Where previous versions could import and export Office files, Google's apps now use QuickOffice to natively edit Word, Excel and PowerPoint files without converting them. Native Office editing is currently available in Android and in the Chrome browser, and will come to iOS "soon". Document collaboration has been significantly improved too. Change tracking has been overhauled to make it easier to see what's been edited, especially when multiple users have been involved. Google also unveiled a mobile version of its Slides presentation program at the I/O conference. It's not the prettiest presentation package out of the box, but the ability to create or edit presentations on mobile Android or Apple devices is worthwhile. The rise of Bring Your Own Device (BYOD) means that many organisation's mobile devices are used for both business and personal purposes. Android for Work, which will be part of the autumn Android L (Android 5.0) release and made available afterwards for existing Android 4.x devices, is designed to facilitate that while keeping work and play separate. The initiative, which is supported by the major hardware manufacturers such as HTC and Lenovo, will use a series of mobile device management APIs to secure corporate applications on users' devices and enable mass deployment of business apps. A key part of Android for Work is KNOX, Samsung's sandboxing technology, which keeps personal and corporate applications and data separate. KNOX is certified by the US Department of Defense and approved by the UK government's End User Device (EUD) Security Guidance, but despite heavy ad spending Samsung hasn't been able to dent Apple's enterprise sales with its SAFE (Samsung for Enterprise) marketing campaign. By bringing the technology to all Android devices, Google clearly thinks it can be more successful.